Her mother’s fingers, slender and pale slid gently down Veronica’s pink cheek, tracing down to her chin, where they pinched gently before her hand fell away. Veronica reached up and clasped it just as it fell softly against her pencil skirt. She received a reciprocal squeeze from her mother and in a swish of silk lining, her legs began to move. Veronica trailed along, four steps to her mother’s one; the clacking of expensive heels echoing in the cavernous space, each one punctuated with a flurry of taps from Veronica’s little black mary–janes. The hum quiet conversation seemed to fade as they moved down the wide aisle of this cathedral-like construct towards a stand of willowy, pale-faced figures lingering impassively on and around the dais. A heavy medieval chair hunched on clawed feet underneath a stained glass gothic window. The great arched glass window depicted what appeared to be the murder of an angel; the dark-winged demon-victor standing with one foot propped on his prone victim, a claw-like hand gripping a polearm. Veronica’s eyes widened at the sight of it, taking little heed of the huge chair silhouetted against the window’s light or the baleful creature sitting in it. “What’s that, mummy?” Veronica whispered. Her mother’s waxen face peered down at the child’s round, rosy cheeks and her other hand curled closed, save for the index finger, which she lifted and pressed to her lips, her black eyes smiling down on her daughter. Veronica only ever knew her mother as she was, stony and beautiful with hard skin and cold hands. “Hush little one,” she said. Veronica’s eyes dropped down and her head swiveled forward, finally noticing the occupant of the chair. They walked to the base of the dais and stopped. Veronica’s mother dropped her hand. The little girl stared for a moment at the figure in the chair, her wide eyes fearlessly studying him. As white as a sheet, the reedy, thin man gazed fixedly back at her from the hollows of his eye sockets, the straight, serious line of his thin mouth and aquiline, grave nose lending him a sinister air. His hands, like two spidery, knuckled appendages gripped the thick arms of the chair. His hair was as white as snow long and flowing, curtained in swags on each side of his face, the ends tucked behind his shoulders., hidden partially by a heavy cowl-like hood that was attached to an old-fashioned greatcoat. He wore it over what looked like an ordinary suit of pinstriped suiting wool. His slacks had a neat press-line down the center front of each leg and shoes of expensive black shining leather bound his rather large feet. His knees were spread open, his feet angled outwards. His back was hunched. The cuffs and collar of his pristine-white shirt were only a few shades brighter than the pale skin and his soft snowy hair. He wore an old-fashioned cravat instead of a tie, a shock of sapphire blue against the stark pallet. His eyes were almost white. They made Veronica think of the pictures of wolves she’d seen in her zoo books. “Come here child,” he commanded. Veronica’s eyes traveled across the dais, taking in the other figures that stood like a copse of saplings around him; lean, pillars they looked like, draped in the finest of clothes, just like her mother. In the strange light of the window and its coloured glass, they looked like statuary. They all had the same ghostly white skin, strange haunting gaze and indifference washed across their remarkably beautiful, stony faces. Veronica then looked back to the man in the chair, and she climbed the four steps up towards him. She glanced back at her mother, who merely prodded her forward with a jab of the chin. Her beautiful, elegant mother. With a strange trusting smile, she stopped between his knees and then climbed up onto his lap, settling her little behind on one of his thighs and smiling at him as if he were the anti-Santa. She gazed up at him, her wide green eyes, her strawberry-tinted curls and vibrant, plump and fresh skin a stark contrast to the man on the throne. Her little black pea-coat was partially open to reveal a dark plaid dress and her ivory tights. She swung her feet in delight. One of the long-fingered hands lifted from the armrest and lighted gently on the child’s head, a soft smile formed with a slow grace on the man’s lips. “She is perfect,” he said. Veronica’s mother smiled too. His approval seemed to melt the entourage. The statuary began to move, sliding inwards towards her, hands rising to touch this little girl. She sat there with a bemused smile as they patted her and touched her little arms and back, stroked her cheek, caressed her soft curly hair and gazed with wonder at her tiny fingers. They seemed to delight in her vibrancy, celebrating it with their strange subdued joy. When Veronica had enough of being poked and prodded, she grew pouty and started swatting their hands away, causing a ripple of amused and enchanted laughter from her tormentors who found her obstinacy charming. She furrowed her brow and her lower chin pinched; her eyes threatening tears. She squirmed down from the man’s lap and tottered back to her mother, who leaned down and scooped her up, propping her on her hip. Veronica laced her arms around her mother’s cold neck, and nuzzled in, her warm tears falling onto her mother’s marble skin. Her burdensome sigh received even more titters of amusement from her coven of admirers. “She will remain with the coven,” the ageless white-haired man told Veronica’s mother. “She is worthy.” Off in the distance behind them, a woman started weeping. Veronica’s mother turned to look back into the darkness they’d come from, her face falling into a frown. The statuary’s faces followed the sound in unison, their hard brows pressing down in collective annoyance. “Elise, you were warned about coming to the temple during offerings...” the man in the chair boomed. A slip of a thing materialized from the shadows of the nave and padded barefoot to the base of the dais, her eyelids red with tears. She was like Veronica, a vibrant living thing, tall and lithe, graceful and beautiful with blue eyes and black hair like skeins of silk cascading down her shoulders. She wiped her eyes with the back of her hand, the skirts of her gold and cream summery dress flowing about her in a careless, waiflike way. She looked like she’d just come from a picnic, or a walk on the beach; something warm and lovely and temperate and welcoming; certainly not from anywhere with cold stone walls and the flags beneath her perfect toes. “It is her lot. As it is yours. Nobody chooses," the master snapped. Elise turned to the woman holding the child. “Helena, you cannot consign her to the coven. You know what will happen if she is deemed worthy... you know her fate. Set her free, give her to the mortals... they don’t have to be imperfect to know the joy of mortality. She deserves better... We all deserve better,” the girl pleaded to Veronica’s mother. “I won’t give a child to this coven. I won’t consign a life I created to the ruin I am destined to become," she sobbed. "How I wish I had been imperfect... How I wish you'd have cast me off to the mortals like so many of our sisters and brothers." “Can you offer her warmth and affection like you could before when you were mortal?” Elise spat. “You might as well be made of stone. She will never know those things, all she will know is cold and stone and harshness if she is accepted and bade to return with you.” Veronica huddled closer to her mother and made a little noise of fright at Elise’s outburst. Her mother’s cold, hard hand slid up and caressed her hair, pacifying her with her soothing voice, and rocking her on her hip. “Enough!” the man on the throne rocketed to his feet and strode forward. “It is how it has been for centuries. It is how we choose our children and how we propagate. It is how we sustain the purity and superiority of our race. You have your place, you will keep it. It is your turn. It will be her turn someday. There is no choice. You are born to our line. It is who you are. Now I have had enough of your intrusions and protestations. You can either be changed now, or you can be changed later after you’ve given the coven a child, make your choice!” Elise fell into renewed tears, covering her mouth with her hands. After a lengthy pause awaiting her choice, the leader sighed in resignation and shook his head regretfully. “We had chosen such a fine mate for you, the perfect father for the perfect child, Elise. He is one of the finest prospects from the Nettle Hill coven; a beautiful young man who embraces his future with open arms. Why would you force our hand so when you have such beauty and grace to look forward to? How can you decline such joy at the opportunity to do something so sacred for our coven? To serve your people so honorably? How could you force our hand?” He looked betrayed as he spoke, his palm out before him as if offering her something; or supplicating her in a saintly manner. “Just because we’ve done it for centuries doesn’t make it right,” she sobbed. Elise’s impassioned plight made her insensitive to her surroundings. The statuary had somehow appeared behind her, closing in on her in a shrinking arc. She did not notice. "Then you have made your choice," the master said sorrowfully. Elise glared at her and turned to run away, only to run into the forest of the lean figures surrounding her. With a strange silence, their pale hands reached out and covered her shoulders and her head and they huddled in on her. She was subdued with little more than a whimper and her slim body crumpled to the ground underneath the weight of their voracious bites. Veronica’s little legs swung as she sat on the top step of the dais. Underneath her bum, to keep her warm from the cold stone, the master had laid down his greatcoat and hood for her to sit on. The coven lingered around her, as if feeding from her innocence, their eyes although seemingly cold were loving and benevolent. The child felt it and she knew. She hummed a little made-up tune. Her mother was kneeling down, her form so elegant in her pencil skirt and her black heels and her crisp white shirt with the little bows on the sleeves. Her golden hair was tied back into a stylish French twist and her white ears were adorned in simple pearl drop earrings. She had her hand on the still form on the ground by the dais, her brow creased with concern. “Elise...” she whispered. The form stirred and the girl sat up; her once vibrant skin now drained of its youthful flush, her softened lines somehow slightly hardened. 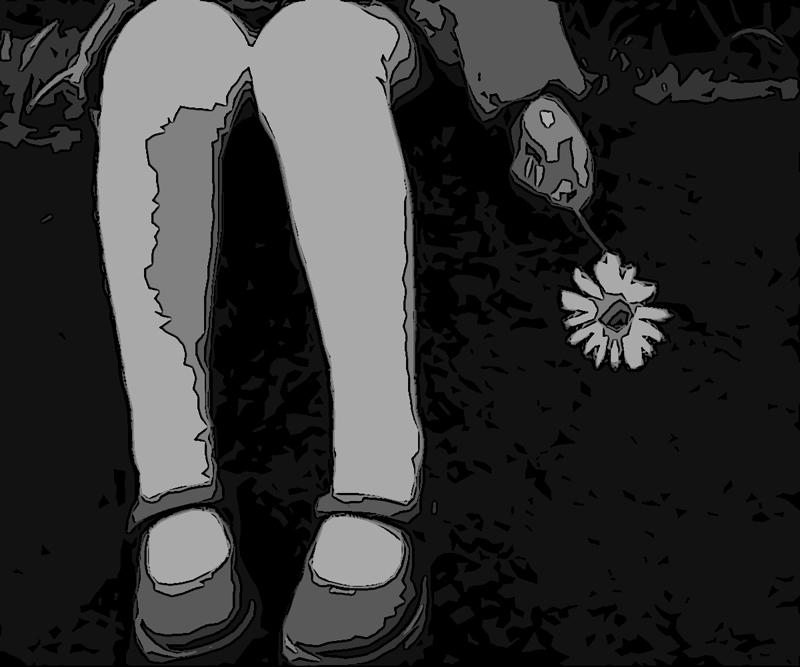 She looked lost and innocent for a few shades of a moment, sitting up, her legs curled beside her. She looked around with the expression of a child, her beautiful eyes wide and searching as she scanned the darkness beyond the light of the window, and then turned to fix them on the coloured shards of glass with great fascination. “So beautiful...” she whispered. Her eyes dropped down to Veronica, who still hummed her little tune and rocked on her throne of wool. The master’s hand was on the small of her little back, a fatherly smile wistfully brushing his lips. Elise froze and she got to her feet, padding to the creature who had only a few moments before, invoked such sadness in her. She stooped and put her hand on Veronica’s fabric-covered knee. “Hello precious treasure, precious, precious gift...” Helena straightened out her lithe form and fell into the same hanging demeanor of the others, still and narrow like a stylized shape, a young oak, watching. “It is the only way for us to know true family, Elise. To raise our children and our grandchildren. To fill our covens with worthy souls and pure blood and not simply with strangers changed in an alleyway somewhere like so many of the newer covens do. It is why our coven is so much stronger. “Do not burden her with blame, master. She should not be punished for what she ultimately could not control. We all remember how powerful mortal passion can be,” someone muttered. Elise straightened and seemed to take account of her body, as if making its acquaintance for the first time. She twirled like a dancer making her skirts flare out into a rippling flower. Veronica’s peals of delighted laughter filled the buttresses of the great temple and then ricocheted back onto the nave. The statuary seemed to swell from the sound of it. Elise vaulted away and little girl the leapt to her feet and followed, her giggles and her exuberance filling the hollow space with life. Tinna’s Might is turning out to be more of a bear to edit than I had arrogantly assumed. I thought the edit would fly by, but I am fortunate to have someone (Ien Nivens) editing the book who has invested himself in it as well and feels strongly about making bold suggestions for the work. The editor also happens to be a writer which adds an interesting element to the process. Recently, there had been a longer-than-usual gap of time between edited chapters. I dropped him a note asking him if everything was okay. He wrote back that he had the chapter finished and sent along a note asking me how open I was to suggestions of ‘significant change’. At first I was like... Uuuuuughhhhh... Seriously? But then I read his explanation and could not deny that he was totally right. He was concerned about the timing of a significant turn in the plot, the build-up (or lack thereof on my part), and the way the story is divided up (chapter and break-wise) to maximize the impact of this plot-turn. Ien was completely 100% correct in this determination. It’s funny how when you’re writing and proofreading as you go along, in your head you think that something is impactful enough—that it makes a statement—when in truth, you haven’t featured it enough so that the reader will recognize it as a significant moment in the story. I simply didn’t see it. But Ien did. He was a bit reluctant to ask me to make this huge change, and sent me a note that was almost apologetic about it. I promptly responded with a: “No, no, no! You are totally right. This is exactly the sort feedback I need!” note. His suggestion really proved to me that I picked the right person to edit this book. He was vastly relieved by my non-defensive response--and probably a bit surprised because we writers can be whiny sometimes. What Ien disclosed to me after was that he too is in the middle of his writing project and he realized he was asking me to do something he needed to do as well. So he took the extra time do it with his own work so he could feel okay about asking me to make a large change. So to work I must go. His edits are wonderful and he’s doing a great job. But what I appreciate most is that he believes in what I’m writing enough to be honest with what he thinks needs to be changed. He’s cautious about it, probably worried he’s going to hurt my ego or something. But luckily, I’m okay with criticism. I even value it. A friend of mine calls criticism a form of ‘excellent failure’. She says it’s something to learn from, not something to hide from. She’s not wrong. Yeah, it hurts when someone picks apart what you’ve painstakingly written—but ultimately, these editors are looking at our work from the perspective as a reader—and helping us to make sure our story is told in the best fashion possible. Ien is extremely respectful of my style, and so was my first editor, Dorrie O’Brien; although I have to say that I sort of wish Dorrie had been a bit harder on me—and suggested some big changes along the way. Someday, I might re-edit Tinna’s Promise. What I would change first off, would be the first chapter. I don’t think it was a great idea to start a book off with someone you didn’t really like very much (although given a chance, Taneth grows on you)—but your opening pages are crucial to draw the reader in, and an arrogant rant just isn’t attractive. You live, you learn. Tinna’s Promise remains something I’m very proud of and I stand by it, even with the questionable choice for a first chapter. But I do hope to fix it some day. The moral of my story is... editing is a crucial process a book must go through. And honestly, it makes a better writer of you. Challenges and huge changes may arise, and it might make you want to cry into your soup, but in the end, you’ll have a better product for it and you’ll be thinking about that on your next project. I cannot tout editing enough. I confess with Blackroot, I didn’t bother, but Blackroot is a source-story, not a full novel; I took elements of Blackroot and spread them out in the Tinna Trilogy, so I look at Blackroot like practice rather than the real thing, so I won’t invest on editing for it. It’s just a lark. The Tinna Trilogy is not. I take these three books very seriously. I realize how important it is to make sure that there is as much effort invested in lending them quality and worth as possible; not just for the readers, but for my own integrity as a writer. 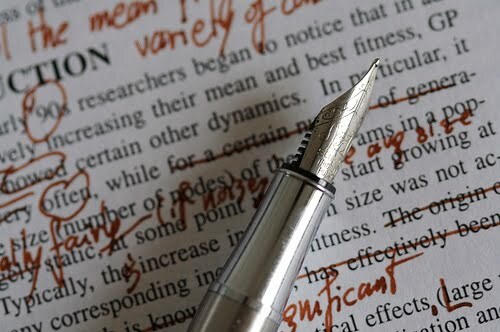 So find yourself a good editor—and listen to them—even if the things they ask of you aren’t always what you want to hear.